The last time I was in Italy I was with my mom, and as I recall her top three goals were to see the Sistine Chapel, see the David, and Eat Cannoli. While I didn’t get around to finding a vegan version for myself on that trip, I have since learned a really cool way to make them at home! Blend your egg replacer and set aside. NOTE: It took me a long time to become convinced it was worth mixing this in a blender rather than simply whisking it by hand, but everything they tell you about this is true. Whipping it into a bona fide froth really improves the quality of your end results. Go ahead and do it, it’s worth cleaning a blender for. Cream margarine and sugar. Add blended egg replacer and extracts or zest if you’re using them. Add flour (sifted) last and mix into a smooth batter. Onto a baking sheet lay out a sheet of parchment paper or a reusable baking mat (such as a Silpat–I love those things). You need this because you’ll be baking some very thin cookies which need to be peeled off of the baking surface and you don’t want the backing to be rigid. Using a spoon, spread batter into some oblong ovals. The size is up to you, just try to keep the thickness consistent. DO NOT BAKE MORE THAN THREE AT A TIME! I made this mistake when I made my first test batch, you’ll see why it’s important in a minute! Bake at 375 for about 8 minutes. The edges should start to turn brown and the middles should be cooked but still poke-able. While they’re cooling (it’s really magical to me how they hold their new shape! ), make your filling. *2 cups RAW cashews, pre-soaked and drained (plan this ahead at least 4 hours). *OPTIONAL: 1/4 cup cocoa powder, 1/4 cup chocolate chips, 2 tablespoons brandy or other liqueur, 2 tablespoons espresso–you can really flavor this however you like. Leave out the lemon juice if you’re using a different liquid flavoring. Blend in a food processor, on high, until it is very creamy. If you have a pastry bag fill it up. If you don’t, worry not! Fill a ziploc bag with filling and snip off one small corner. 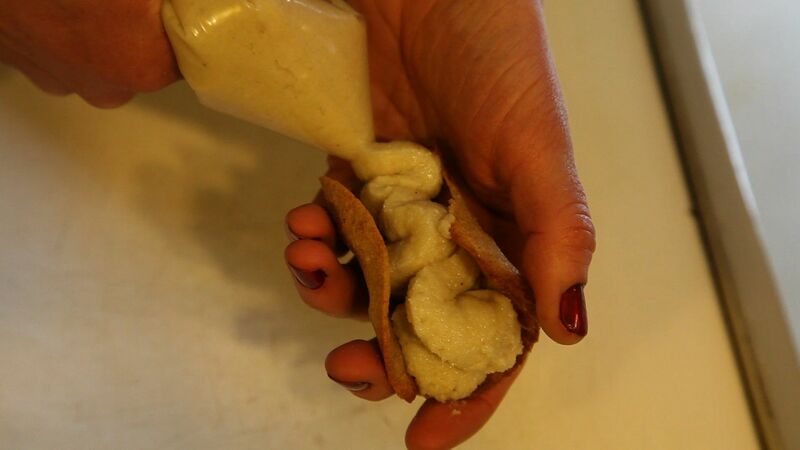 Squeeze filling into your now-cool shells. Dust with cocoa powder, or shaved chocolate, or coconut, or cinnamon, or citrus zest, or really any kind of garnish your heart desires. Share with someone you love, or eat them all yourself. Please enjoy this very serious instructional video that Joe and I made to assist you. It also includes some essential vegan vocabulary for when you travel to Italy! Vegan Cannoli from Intrepid Herbivores on Vimeo. The one drawback to the baked-not-fried method is that once the filling is introduced they do not stay crispy as long. Thus, it is recommended that you fill them shortly before you intend to enjoy them, or keep the baked and formed shells and the filling separate until you’re ready to eat or serve them, rather than pre-making them all at once. The shells themselves will stay crispy alone for quite some time, but they love to drink up the moisture from your cashew cream (you will too). This entry was posted on February 14, 2013 by sadie in Uncategorized.